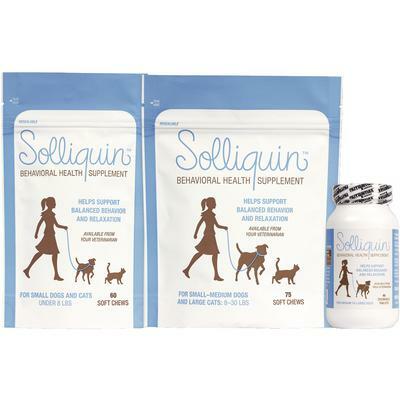 SOLLIQUIN is a supplement for dogs and cats intended to help support normal behavior and facilitate a calming effect. Nutramax Solliquin is a supplement for both dogs and cats meant to help back normal behavior and ease a calming effect. It contains L-theanine, magnolia and phellodendron extracts, as well as a select concentrated whey protein, providing the benefits of all four ingredients in a convenient, once-daily soft chew or chewable tablet.